HAVE ENTERED THE MODIFIED DIVISION..
What started out about a month or so ago as a joke has turned full circle. Far Out Fishin, Blake Tobias Motorsports, and Frank's Truck Lettering has decided why not, the time is right, and we aren't getting any younger, so all three parties have decided to join forces and field a potent small block modified that will make limited appearances in 2010 at various tracks in both PA, and NY. The F.O.F. / BTM / Frank's Truck Lettering Team has been busy working on a brand new 2010 Teo Pro Chassis, with Jim Kost doing some safety cage additions to get slated Driver Blake Tobias ready for some racing action. The Team will release more information in the coming days, and they are putting together a list of tracks which they want to race at in 2010. All three parties have agreed that they want to travel to different tracks, and not commit to racing on a weekly basis at any one location. We want to have fun, meet new people, and we are all very excited to have this turn into a reality. Check back for more updates. 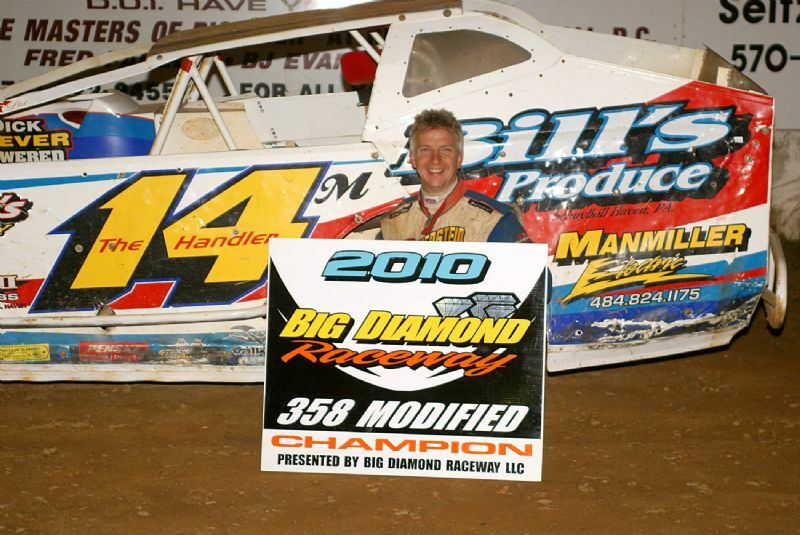 Doug Manmiller celebrating his 2010 Points Championship at Big Diamond Raceway. Doug Manmiller a sponsor and part time racer at Hiester's H.O. Raceway is having a real strong year on the race track at both Big Diamond and Grandview Speedways thia summer. At Big Diamond Doug is the 2010 358 Modified Point Champion. Congratulations to Doug and the entire Josh Biever on your track championship. The impressive part is that Doug won the points without a win or even a second place finish all year. This proves consisancey pays off more than just pure speed. At Grandview Speedway Doug is 7th in the points battle. Another part time slot car racer at Hiester's H.O. Raceway enjoying a very solid year on the dirt tracks is John Willman. John has 1 feature win at Grandview and is sitting 5th in points battle at the always tough 1/3 mile speedway. At Big Diamond John finished 3rd in points enjoying a solid year up in God's Country aboard the EZ Release Pro Shops modified.